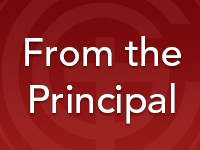 This is my final ‘From the Principal’ for 2014. Merry Christmas to all in the Galen Catholic College family! May the peace and blessings of Christmas be with you all. The VCE and VCAL results for 2014 were released on Monday. We are very proud of the great results achieved across the board, especially those gained by students in both certificates who put in their best possible effort, regardless of individual scores. I am very happy to announce that the Dux for Galen Catholic College for 2014 is Demi Shale who achieved an ATAR of 98.25, placing Demi in the top 2% of all students across the state of Victoria – an outstanding result! Demi will be taking a Gap year in Canada in 2015 then hopes to enter University of Melbourne with a focus on Maths and Physics. • 20 VCAL students have completed their Senior Certificate. I would like to thank Mr Gerard Sullivan for his work as Acting Principal during my long service leave for the first 8 weeks of 4th term. The bulk of my leave was spent walking the Camino Trail, an ancient 800 kilometre Christian pilgrim trail that dates back to medieval times – a physically challenging but immensely rewarding spiritual experience. • Mr Matt Henderson whose contract with Galen expired at the end of this year.